I have been meaning to blog about the Gravity Block of the Month I signed up for ever since I started it back in February. This is actually one of the very few BOM's that I've managed to keep up with. I've finished every set of blocks before the next ones have arrived. However, I've never managed to write about it before getting the next package. So I tell myself I'll blog as soon as I finish those blocks. And well... Here it is 4 months later. The pattern is by Jaybird Quilts. It's a great size at 96" x 97". You need 2 of her specialty rulers to make it: the Super Sidekick ruler and the Hex n More ruler. I've already used the Super Sidekick ruler for other things so I see that one being very handy. There are 114 different fabrics in it. The first month I got the book and rulers along with the fabric, but every month since then I've just gotten the two different packs of kona cotton. There are 6 different colors in each package and each color is clearly labeled in case you need/want to get more of that color. 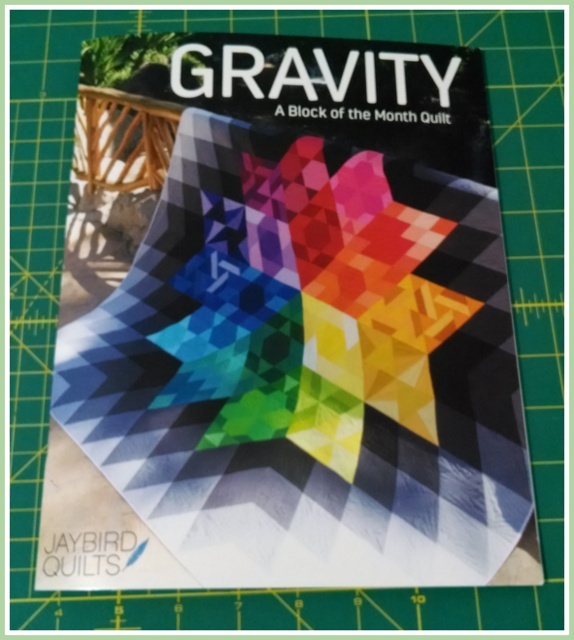 Each month you make the same block in 2 different colorways. These are the most recent blocks. This quilt goes with nothing in my house. It certainly doesn't coordinate with my bedroom. I thought about that carefully before I signed up, but then did it anyway. I love the colors and pattern that much. I'll figure out how to make it work somehow! This sweet girl is home after receiving radiation treatment for her hyperthyroidism. She's doing well and having no side effects other than the fact that she's radioactive for the next couple of weeks. We're supposed to be careful and try to stay away from her. Of course, since she's come home, she will not leave me alone. For a cat that likes to hide in the closet, she is sticking to me like glue. I wonder if I might start glowing in the dark or perhaps develop quilting superpowers??? Beautiful quilt. I love bright colors and Jay Bird patterns! I hope your sweet girl is doing better! WOW! WOW! WOW! That quilt is going to be wonderfully colorful and geometric! Amazing that they don't want you near her after the treatment.......that almost sounds mean!